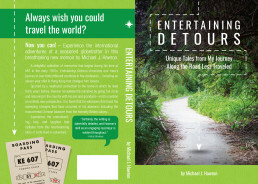 For Michael Hawron’s first book, he wrote about the adventures he’s had throughout his life while living in many different places around the globe. He wanted to use a photo he had taken of an actual trail he walked during the time he lived in Hong Kong on the front cover. I loved how the trail takes a turn and disappears in the background of the image and I wanted my design to convey that sense of meandering.